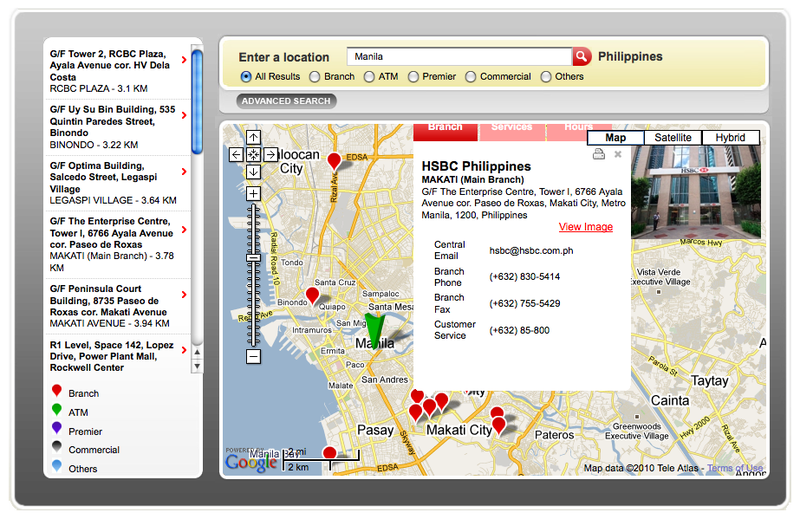 Since my car is broken, ive been a bit lazy to go to Alabang at the usual branch where I pay my HSBC bills. I told myself that within this week, I'd find time to pay both my Globe and my HSBC bills since both are due some time next weekend. Surprisingly, I liked HSBC's branch locator website which uses Google Maps API to map out different branches, the services offered, banking hours and even a picture of the branch itself. Its pretty great how companies takes advantage of Google Maps API. Try it out for a spin! Click here to go to the website.